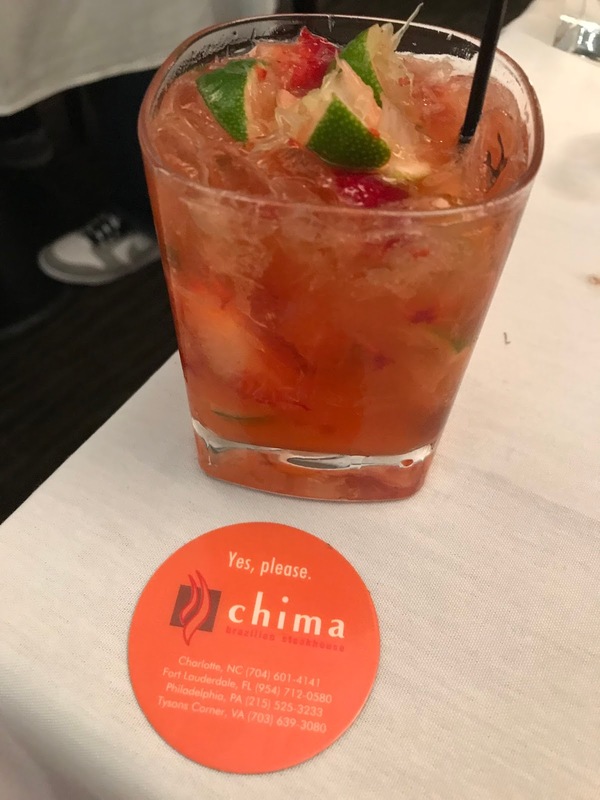 I headed into the city tonight for a date night out at Chima Steakhouse in Philadelphia and I was so impressed with my first experience at a Brazilian Steakhouse! The hosts and waiters were so friendly: we were seated right away and got to try three of the specialty cocktails curated by Hop Sing Laundromat (fancy schmancy bar in Chinatown Philly) specifically for Chima that are only $10 each! 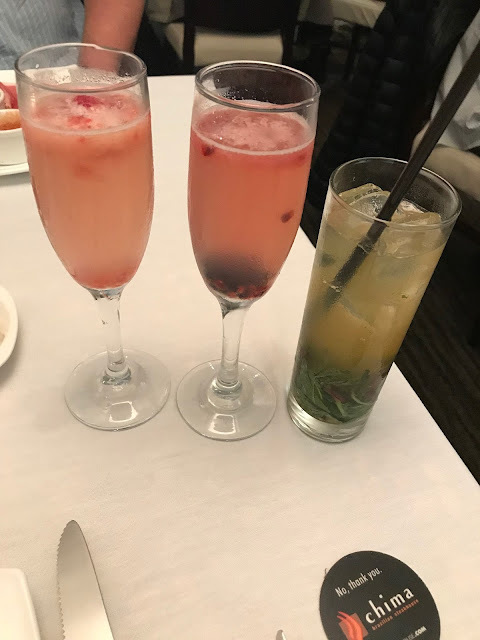 The two drinks in champagne glasses are Brazilian rum and fruit based drinks called the Gaucha (cowgirl) and Gaucho (cowboy) made with raspberries and blackberries. The third drink was a Rio-Cha made with ooling tea, mint, agave and lemon. The blackberry rum drink was my favorite and my boyfriend really liked the Rio-Cha. 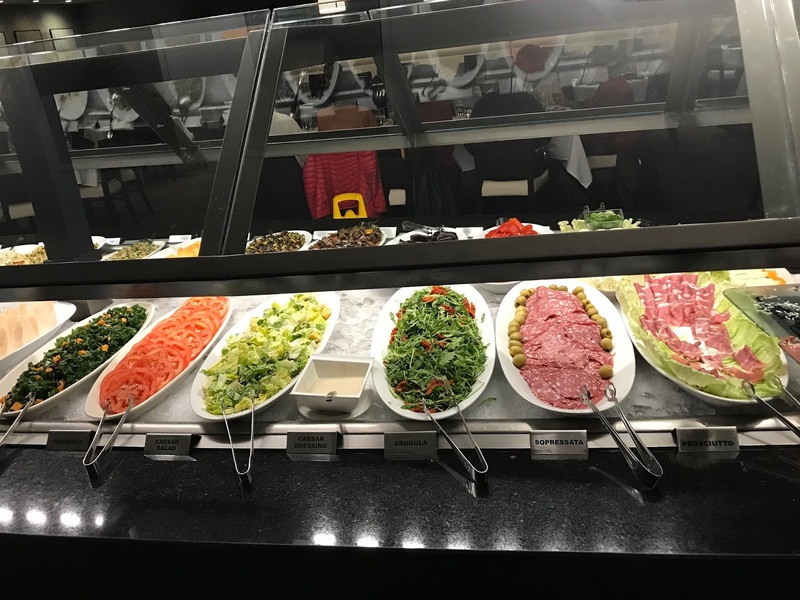 The first course that you could help yourself to was the salad bar full of meats, cheeses, specialty salads and some fun extras! We were warned not to get too excited and fill up too much from just the salad bar since we had quite a lot of eating ahead of us after the salad bar! Regardless it was fun to take some small samples of different items - especially some things I had never even heard of or tried before. 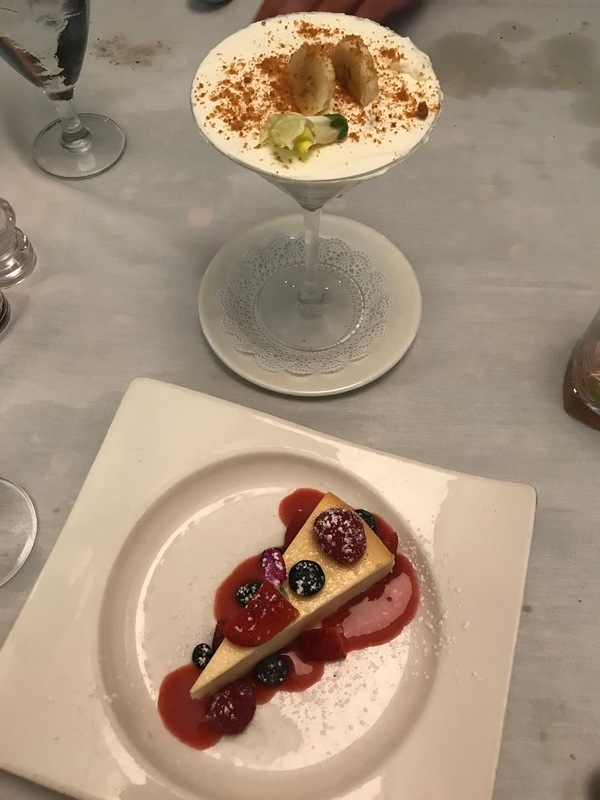 Gorgonzola Mousse?!? I was very intrigued by this one. It was a funky texture but ended tasting amazzzzzing. I didn't even know cheese mousse was a thing! After the salad bar it was time to start in on the MEAT! When you are ready to start on the entree portion of your meal you just need to flip your little coin over to "Yes, Please." There are multiple "Gauchos" who roam around the dinning room carrying over 15 different kinds of rotisserie meat on skewers and will visit your table and ask it you want some of that specific kind of meat! 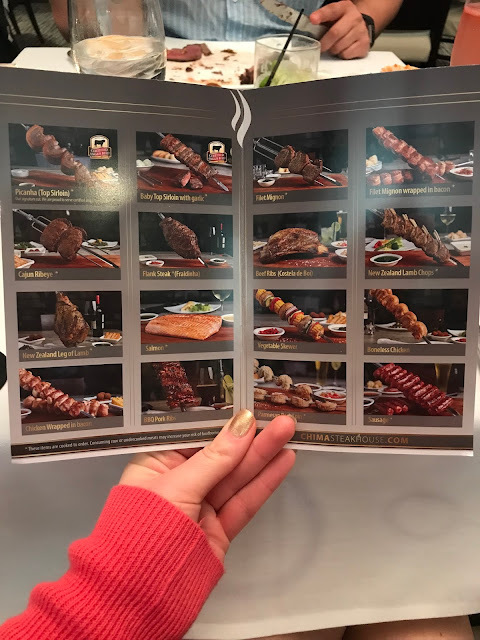 They cut a portion off right onto your plate - including your preferred style of cooking method for certain meats such as rare, medium well, etc. My boyfriend is a meat LOVER and was literally in heaven all night. 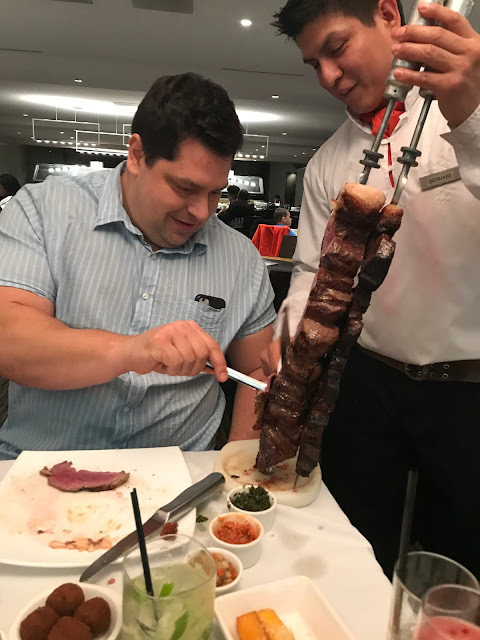 Here he was getting about his third helping of the beef picanha - top sirloin which was literally AMAZING. I'm not huge on beef but even I had a second helping of this cut. I'm pretty sure this was literally the best piece of beef I've ever eaten in my life. 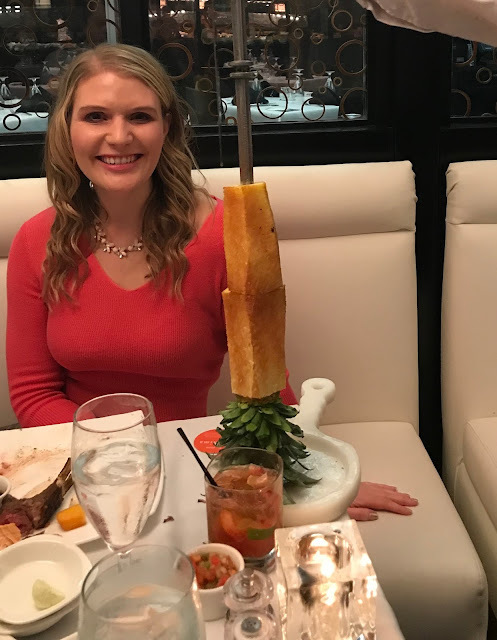 Besides the amazing meat selection there was also cinnamon dusted pineapple which I was obsessed with and a selection of traditional Brazilian appetizers on the table including fried bananas, Brazilian cheese bread, fried polenta, turkey pate, and croquettes. I may or may not have eaten both fried bananas and three of the cheesey breads while my boyfriend literally had nothing but meat haha. All about those priorities! Even though we stuffed ourselves during the meal...I always have to end with something sweet! I had a New York style cheesecake with berries and my boyfriend had a "Banoffee." 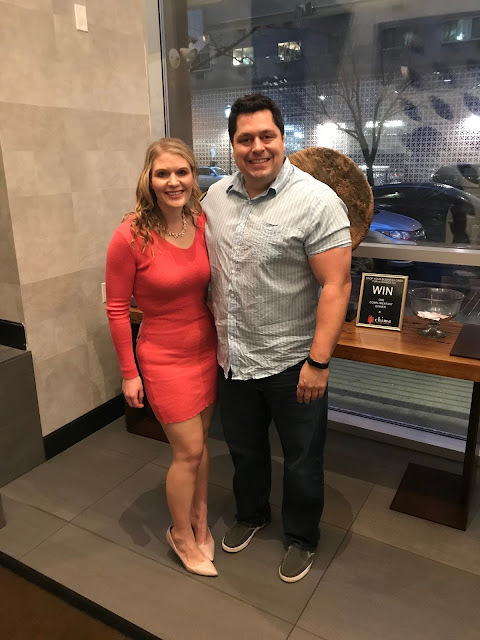 Both were FABULOUS and worth every single calorie. Thanks Chima for a great dinner and way to celebrate this weekend! That's really sweet about wearing the same dress. Have you ever gone to the Mummers Parade? I've been in Florida for 38 yrs., but was born & raised in Horsham Pa.( a Philly suburb right up rte. 611). Still miss the food & it's not New Years without the Mummers. I know exactly where horsham is (i live in montgomery county! but have never been to a mummers parade. No way! We actually had a Hatboro address because back then Horsham didn't have a PO (it was rural farmland) & if you wanted your mail delivered that's what ya had to do. I lived close enough to Willow Grove NAS to hear taps & revelry from my bedroom window. Graduated from Hatboro-Horsham HS in 1977. We used to go to Horsham Diner, Red Lion Restaurant & Warminster Diner for late night breakfast. Very cool to "meet" somebody from my little corner of the world.